We’ve all seen the symbol of the letter “c” inside a circle on the first page or two of books, but what does it mean? A copyright is like a bank vault or locker for writers, musicians and artists. It protects songs, poems, novels and paintings from being stolen. As soon as something is created, it belongs to the person who created it. Nobody can use it without permission. 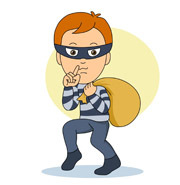 If someone shares, borrows or steals any part of a book, song or illustration, they are no different than a bank robber who has broken into the vault and stolen money. You see, authors, musicians and artists get paid when they sell their work. If someone takes any part of that work without paying (or asking permission), money does not exchange hands. The work has been stolen. Most people don’t realize that recording a song from the radio onto their ipod or their phone is breaking copyright. They don’t think anything of reposting a picture on the internet that someone else made. They have no idea that copying someone’s writing makes them a thief. But doing all those things can get people into big trouble. If they try to pass off someone else’s work as their own, they can get fined, kicked out of school or fired from work. So, how do we copy the right way? Get permission. Pay for your own copy of a book, a picture, a movie or a song. And always give the creator credit. For instance, the image used above came from Classroom Clipart, a source of cool pictures that are available to members. I can use the pictures from their website for some things, but I can’t sell the pictures or anything with their pictures on it. Authors, musicians and artists don’t like to work for free. Would you? Curious minds want to know. Comments Off on What is a Copyright? *All content on this blog is copyrighted by Cat Woods and cannot be used without her explicit (that means clear and obvious) permission. If you would like to use content, email catwoods.writer@gmail.com. *None of the information you share on this blog--including names, user names, email addresses, etc--will be kept or used in any way. I will not spam you. I will not share your information or sell it to anyone else ever. The only time you will receive anything from me is if you sign up to get my blog posts delivered to your email--or if I have a contest and you win something.